The MIC2027 and MIC2077 are quad high-side MOSFET switches optimized for general-purpose power distribution requiring circuit protection. 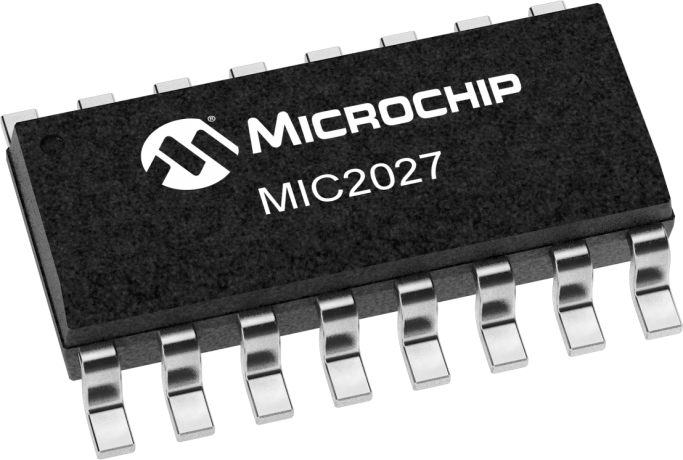 The MIC2027/77 are internally current limited and have thermal shutdown that protects the device and load. The MIC2077 offers “smart” thermal shutdown that reduces current consumption in fault modes. When a thermal shutdown fault occurs, the output is latched off until the faulty load is removed. Removing the load or toggling the enable input will reset the device output. Both devices employ soft-start circuitry that minimizes inrush current in applications where highly capacitive loads are employed. A fault status output flag is asserted during overcurrent and thermal shutdown conditions. Transient current limit faults are internally filtered. The MIC2027/77 are available in 16-pin narrow (150 mil) and wide (300 mil) SOIC packages.